For the last few years, we have used Borax in our DIY Household Cleaners – from laundry, to scrubbing sinks…for our homemade dishwasher detergent and more. People have used Borax for years – it was initially discovered in Arabia over 4,000 years ago. Now, you can find Borax being mined in California… it’s common in the Southwestern United States, and places like Chile and Turkey. Borax is a naturally occurring mineral found in dried salt lake beds – it is made of water, oxygen, boron and sodium. Just those 4 ingredients. One of those ingredients – Boron, is a trace mineral nutrient. Boron is needed to maintain a healthy body … it helps support healthy bones and teeth as well as the absorption of calcium, magnesium and communication between the body’s cells. It also helps regulate the body’s hormones, too. Boron is something that’s actually found in vegetables and provides as much as 5mg per day – but then that can vary largely on where the vegetables were grown, too. Boric Acid is not to be confused with Borax – it’s actually made by mixing Borax WITH Sulfuric Acid. And yes – it is dangerous stuff! Boric Acid is toxic – and commonly used to kill ants, roaches and is a pesticide – it is not to be confused with the Borax that you find in the white box in store. Studies on Borax usually confuse Borax with Boric Acid (which, as mentioned above) is not the same. Boric Acid is toxic – there is no doubt about that. Studies on Borax are done on animals and usually include an overwhelming amount of Borax. .. but anything in high doses can be toxic – right? Borax is extremely alkaline – hence it does a very good job at softening hard water and cleaning your clothes in the laundry – it’s similar to washing soda and baking soda in the aspect that the high alkalinity can cause some skin irritation. But… it won’t penetrate the skin and it does not accumulate in the skin. If you reference the Material Safety Data Sheet (MSDS), you’ll see that Borax is classified as as a “1” – which is the same classification given to salt – table salt actually. So What is Borax Used For? We have used Borax to make our own laundry detergent for the last few years – likewise, we have also use it in our carpet (if you didn’t know, Borax kills fleas and dust mites through dehydration). I have also used it to get rid of ants… and likewise, cockroaches – here in Arizona, cockroaches love to gather in large numbers where the water meter sits, under the ground in the front yard. Lift the cover and they congregate – mixing Borax with water and a little sugar to pour in that box helps get rid of them quickly without having to deal with a pest company. Believe it or not, the chemical reaction of Borax and water produces hydrogen peroxide – which is the #1 ingredient in OxyClean. We aren’t advocating that you ingest Borax, but it has been mentioned that in small amounts, Borax and water can help treat health conditions like arthritis, prostate cancer, candida and more. It can even help with autoimmune disease. 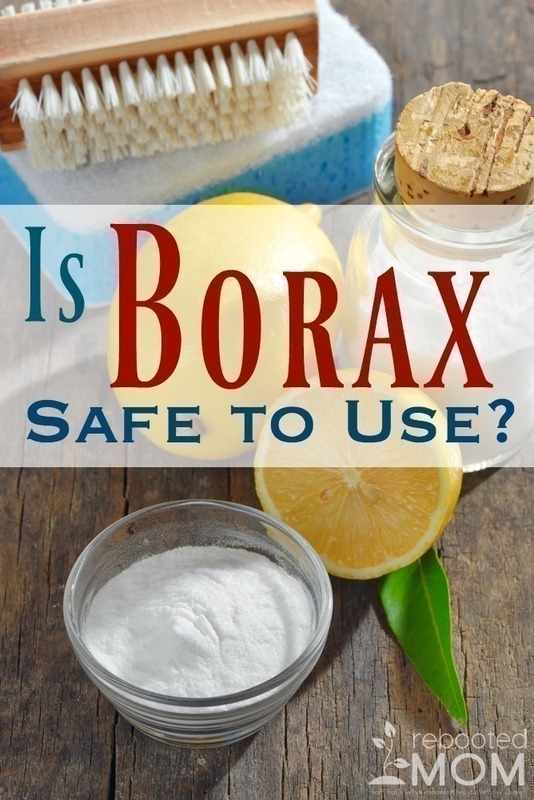 Borax is commonly promoted on frugal living sites in DIY cleaners – and though I haven’t ever questioned its safety, many others have… and you will often hear it touted as being “unsafe”. If it has some health benefits, why does it have such drastic warnings? Considering it’s no more dangerous than table salt (which, in excess, can be bad for you too…), if it has the ability to treat health conditions favorably why do so many swear that it’s so harmful? Do you feel comfortable using Borax? I do – I really mean that. I feel comfortable using Borax in my cleaning products – it’s no more unsafe than baking soda or salt. And since it doesn’t absorb through the skin, it’s not as harmful as some of the commercial products on the market – that ARE unsafe for your health. As with any product (baking soda, washing soda, borax + more) it’s always wise to understand that overuse can be dangerous. Share the post "Is Borax Safe to Use?"